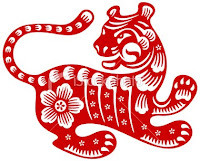 The Year of The Tiger begins on February 14th 2010. Drama, intensity, change and travel will be the keywords for 2010. Unfortunately, world conflicts and disasters tend to feature during Tiger years also, so it won’t be a dull 12 months for anyone. The Year of the Tiger will bring far reaching changes for everyone. New inventions and incredible technological advances have a good chance of occurring. For all of the Chinese horoscope signs, this year is one to be active – seizing opportunities and making the most of our personal and very individual talents. Everything happens quickly and dramatically in a Tiger year – blink and you could miss an important chance of a lifetime!